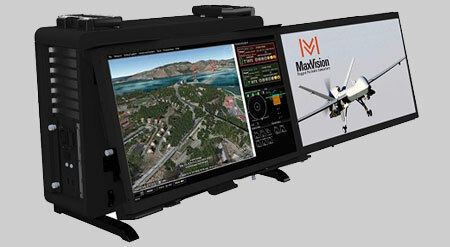 The MaxPac® SL family is a smaller version of the MaxPac XL, but with smaller 21.5” folding and detachable displays. The customer has a choice of either single or dual Xeon processor/motherboard, up to 512GB of main memory, removable 4 x 3.5” HDD data magazine with up to 12TB per drive, a removable 2 x 2.5” SSD system disk magazine which can support up to 3.84TB per SSD, 5 or 6 PCIe Option slots depending on the motherboard used. Choice of either E5-2600v4 (dual or single) or E5-1600v4 (single only) processor families. 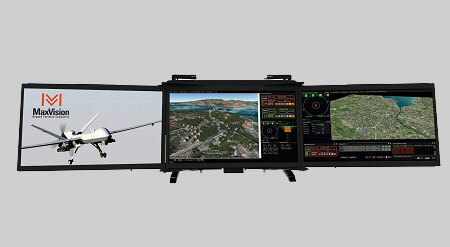 Your choice of modular field detachable folding adjustable displays and other various features and options. Choice of removable 4 x 3.5" HDD or 2.5" x 8 SSD. Magazine capacities up to 48TB. Removable system drives can be single or dual (mirror). Each SSD can be 480GB, 960GB, 1.92TB or 3.84TB. H/W RAID controller is a standard feature of workstations and servers with large data arrays of 4 drives or more. Also supports FIPS 140-2 drives. Six PCIe Full height option slots available. All weather, shock, drop and vibration compliant MIL STD 810G roller transit case. 45dba noise levels with smart fan technology. Optional integrated UPS providing backup power for 5-10 minutes from an 80+ watt-hr LiFePo4 battery. Also provides operation from external 28VDC. Full filtered air using K&N Technology off the shelf filter elements. Easy service optical drive (DVD Burner or BD Burner). Optional adjustable custom table with adjustable legs, chair and keyboard fit into the lid of the transit case. Global quick disconnect 860watt 90-264VAC 50/60Hz global power supply. 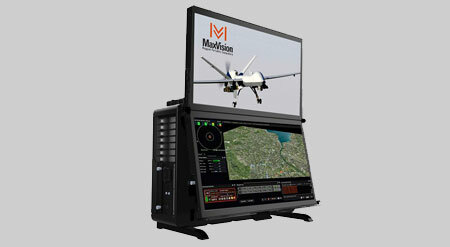 0-50C operation without compromise or processor throttle back during heavy workloads drawing maximum power. K&N filter captures fine particle dust. Transit case provides full drop, vibration, humidity, dust and sand protection during transport. A single rear panel provides access to all serviceable items. 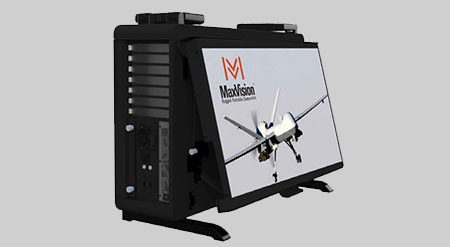 Allows direct plug-in PCIe cards, power supply and motherboard. All removable disk magazines and optical drive trays require no internal access and can be changed in seconds. Detached Keyboard and Mouse with optional CAC card reader. Optional all weather keyboard available.